A tribunal that ruled a teacher was unfairly sacked revealed she suffered sexual harassment and racist abuse at the Kent school where she worked. Samantha Burmis, from Gravesend, was dismissed from Aylesford School after she tried to report two colleagues for smoking drugs on a school trip. She was sacked for gross misconduct for, among other things, drinking alcohol herself during the trip. The school and Kent County Council have appealed over the tribunal ruling. Mrs Burmis said she began to suffer racist abuse at Aylesford School almost immediately after joining in 2001. "It was like a nightmare," she exclusively told BBC South East Today. "I used to wake up in the morning thinking, 'Oh no, not again'. "It just seemed to be constant, especially when it came to the drugs part." Mrs Burmis explained she was always being asked by pupils if she could get hold of drugs "because I'm black and my parents are [of] Jamaican origin". "I think I was treated differently because I'm female and I'm black... the way they treat black people at that school is really, really bad." Her tribunal heard that on one occasion she was called a "bloody immigrant" by a student, and that a fellow teacher told her she would progress in her career if she worked in a "more ethnically diverse school". 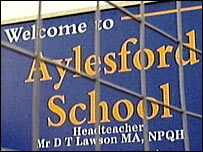 Mrs Burmis reported the incidents to the then deputy head teacher, Douglas Lawson, now head teacher at Aylesford School. The tribunal criticised his handling of her complaints, and found "a culture... perpetuated within the school in which racial abuse from pupils was allowed to continue". It also recorded a "totally inappropriate" response from Mr Lawson to claims by Mrs Burmis that another teacher - Mike Grosvenor - was sexually harassing her. Mrs Burmis and Mr Grosvenor were both involved in a residential school trip with about 50 pupils to Marchant's Hill, in Surrey, in 2003. The tribunal said it believed "Samantha Burmis's account that she was continually sexually harassed by Mike Grosvenor", and that the trip "provided a perfect opportunity" for that to continue. On two consecutive evenings, Mr Grosvenor, Mrs Burmis, another teacher and two teenage "helper" pupils ended up in the same bedroom. Alcohol was consumed, a verbally sexually explicit game was played by the teachers and - on the second night - Mr Grosvenor, the other teacher and one of the pupils went outside and smoked cannabis. Mrs Burmis said his behaviour was "inappropriate", although she admits she did drink alcohol and also participated in the games which, according to tribunal papers, were "of a sexual nature". Mr Grosvenor has admitted to BBC South East that he drank and smoked cannabis on the trip. He said: "I completely regret what happened. "I felt I had let myself down, the pupils down, the parents, and the school." He ultimately resigned, and the General Teaching Council banned him in June 2006 from teaching in state schools for life. But Mrs Burmis said she found it a struggle to get the school to investigate what happened. She said: "The most upsetting part of it is when I tried on several occasions to phone the school, explaining what happened, Mr Lawson was busy, the head teacher was busy, no-one seemed to care." An internal inquiry was led by Mr Lawson, but it ended with Mrs Burmis herself being sacked. The tribunal - which sat for 42 days over the course of two years, and ended in September - described the school's investigation as "chaotic... inadequate and incomplete". As a result, it ruled, Mrs Burmis's disciplinary hearing was fundamentally "unfair". 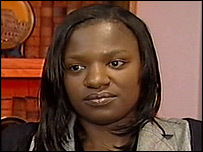 Mrs Burmis won her appeal against dismissal on the grounds of racial and sexual discrimination. Neither Mr Grosvenor, Mr Lawson, the school governors or Kent County Council have accepted the tribunal's findings on her sacking. A council statement said: "The head teacher and governing body at Aylesford School do not accept the judgments made at the tribunal and have lodged formal appeals, which Kent County Council is supporting. "For legal reasons, but also in the interests of the school, its students and staff, no further comment can be made at this time."